The South African Navy is to obtain officially the long awaited Super Lynx helicopters at an official handover ceremony tomorrow (14 February). The official handover marks the ‘completion’ of delivery of the four frigates SAS Amatola, SAS Isandlwana, SAS Spioenkop and SAS Mendi. For budgetary reasons the Agusta Westland Super Lynx 330 Mark 64 were ordered subsequent to the placing of orders for the four frigates and three submarines in the original order. Once in service with the ships the Super Lynx helicopters will however deliver a much-needed surface search capability in anti-surface warfare roles, search and rescue, maritime patrol and other utility duties. The four helicopters arrived in South Africa as cargo carried in the belly of Antonov An-124 transport aircraft last year and were delivered to the Ysterplaat Air Force Base in Cape Town. Flying and navigation crew were sent to the UK to undergo specialised training with the aircraft while maintenance crew underwent training in South Africa. 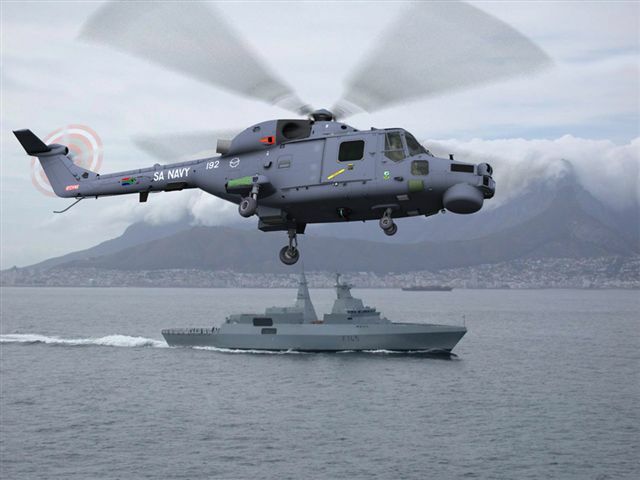 Although adorned with SA Navy insignia and serving on the Valour class frigates the helicopters will be flown by airmen of the South African Air Force as the navy does not have an air arm. In other navy news the German squadron of four ships is expected in Simon’s Town on Monday. The four ships are the frigates FGS Hamburg and Kõln and support ships FGS Berlin and Westerwald.